The tonsils are two oval-shaped glands located in the back of the throat that help fight infections that enter through the mouth. Since they are part of the immune system, they can be considered to be the body’s first line of defense against harmful bacteria and viruses. When the tonsils become infected they swell and can cause a sore throat and difficulty breathing. Inflammation of the tonsils is called tonsillitis. It is more common in children, but can happen at any age. The reason for this is that a child’s immune system is not as fully developed as an adult. To treat tonsillitis, one of the approaches a doctor may consider is surgery. A tonsillectomy is the surgical procedure whereby the tonsils are removed. This procedure is performed on patients who have more than seven cases of tonsillitis in a year, or five cases a year for two consecutive years. Other reasons to perform a tonsillectomy are sleep apnea, loud snoring, tonsil cancer, bleeding tonsils and difficulty breathing. A tonsillectomy usually takes about a half an hour to perform. It is a relatively common and safe procedure, but with any surgery, there are risks. These risks include a reaction to the anesthesia, swelling, bleeding, pain, fever, and difficulty swallowing for a few days. If you or your child is experiencing frequent sore throats and your physician is recommends a tonsillectomy, you can schedule an appointment with a surgeon at Flushing Hospital who specializes in this kind of surgery by calling 718-670-5486. A hysterectomy is a surgical procedure that involves removing a woman’s uterus. It is a common operation, in fact, the CDC reports that over 10% of women between the ages of 40-44 have had a hysterectomy and approximately 600,000 procedures are performed annually. 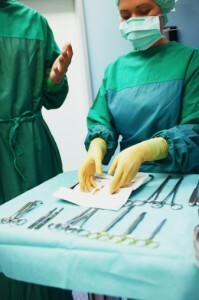 Procedures may require the complete or partial removal of the uterus. If a complete removal is required, a total hysterectomy may be performed. In the case where the uterus and surrounding structures such as the fallopian tubes and ovaries need to be removed, a radical hysterectomy is often recommended. Treatment involving the partial removal of the uterus may include a supracervical hysterectomy. As with all surgical procedures there are risks to consider. However some techniques can offer patients a reduced risk of complications such as pain and bleeding. Laparoscopic and robotic assisted hysterectomies may result in less pain, minimal bleeding, a lower risk in infection and shorter hospital stays. Flushing Hospital Medical Center’s Department of Obstetrics and Gynecology has a full program to provide total health care to women. Our highly trained specialists utilize the latest techniques and equipment, such as ultrasonography, color Doppler, laser, laparoscopic and robotic surgery, in the diagnoses and treatment of female disorders. Robotic surgeons at Flushing Hospital are board certified or board approved and have performed countless procedures resulting in high rates of success. Gynecological procedures performed robotically by Flushing Hospital’s team of surgeons include hysterectomy, ovarian cystectomy, salpingo-oophorectomy, sacrocolpopexy, tubal reanastomosis, dermoid cystectomy and more. You hear the words “robotic surgery” and your natural reaction might be one of fear. After all, surgery under any circumstance is intimidating; adding a robot into the mix could only increase your anxiety. While your concerns are justified, Flushing Hospital would like to share the following five facts about robotic surgery to put your fears to rest. Robotic surgery is always performed by an experienced surgeon. 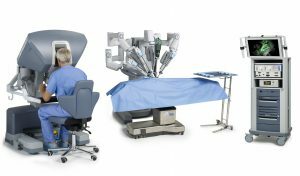 Using the state-of-the art da Vinci robotic surgical system, specially trained surgeons at Flushing Hospital are in total control of small, precise, minimally invasive tools. 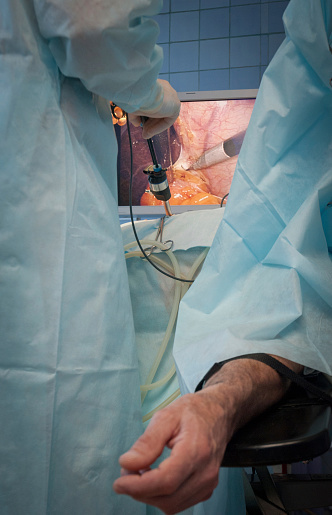 This system offers the surgeon more exact movements and a far wider range of motion within the small surgical site. Robotic surgery means smaller and fewer scars. Since surgeons only need two or three small incisions to successfully complete surgery with the da Vinci Si surgical system, larger, more invasive incisions are now a thing of the past. These small incisions heal much more quickly and resolve with far less scarring. Robotic surgery results in less pain or risk of infection. Minimally invasive surgery results in smaller incisions and much less pain during healing and recovery. Also, since the surgical site is smaller, the risk of infection is reduced dramatically. Robotic surgery results in a much faster recovery period. Due to the smaller incisions, patients tend to recover much more quickly from robotic surgery. In many cases patients require minimal hospital stays and are able to return to normal activities within days of the procedure. 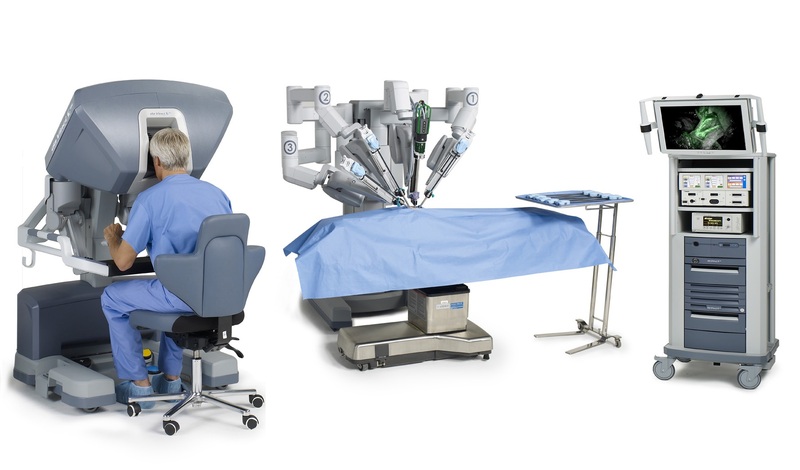 Robotic surgery treats a wide variety conditions. 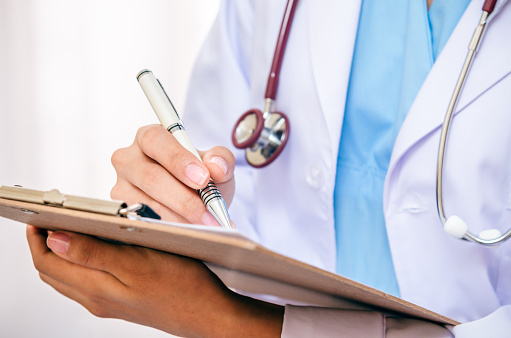 At Flushing Hospital Medical Center, many of our surgical specialists have been trained to expertly complete a wide range of procedures in the fields of gynecology, urology, bariatric surgery, and general surgery. For more information about the da Vinci surgical system at Flushing Hospital, please call 718-670-3135. A hernia is the protrusion of an organ or tissue through the structure or muscle that usually contains it. A hernia occurs immediately or over a long period of time when a combination of muscle strain and weakness is present in the body. Hernias are most common in the abdomen, but they can also appear in the upper thigh, belly button, and groin areas. Most hernias are not immediately life threatening, but they don’t go away on their own and can require surgery to prevent potentially dangerous complications. If you suspect that these symptoms could be a hernia, visit your doctor for an examination of the affected area and be sure to detail all symptoms. If the results reveal a hernia then the next step would be surgical repair. Whether or not you need surgery depends on the size of your hernia and the severity of your symptoms. During hernia surgery, the weak tissue in the wall of the abdomen or groin is repaired with a mesh. Technology in surgery is constantly evolving with the intent of increasing positive clinical outcomes and improving patient safety and recovery. One of the greatest medical advances to occur in the pursuit of these goals was the development of surgical robots. Flushing Hospital Medical Center in its dedication to providing patients with the most technologically advanced tools in health care, acquired the da Vinci Surgical Robot. This tool allows for a minimally invasive surgery offering many benefits including, less pain, faster healing time, shorter hospital stay and less risk of infection. If you have been diagnosed with a hernia and are looking to have the procedure done using the da Vinci surgical robot, Flushing Hospital Medical Center offers this procedure. For more information about robotic surgery or procedures performed by our surgeons, please contact Flushing Hospital’s Department of Surgery at 718-670-3135. The American Cancer Society estimates that over 224,000 new cases of lung cancer will be diagnosed in 2016 and that more than 150,000 will die from the disease this year. Lung cancer is the second most common type of cancer identified in both men and women. A history of smoking definitely contributes to a higher risk of being diagnosed with the disease, though non-smokers also can develop lung cancer. If lung cancer is suspected, a physician will usually order a few tests to make the diagnosis definitive. A chest x-ray will be performed and if there are any lesions found on the lung a CT scan will to get a better view of the lungs. An exam of the sputum can sometimes reveal lung cancer cells and to complete the diagnosis a lung biopsy will be done to examine the cells to see if they are cancerous. Depending on the stage of the cancer, treatment options vary and can include chemotherapy, radiation and / or surgery. A common surgical option is called a lobectomy, removal one of the lobes of the lung. Flushing Hospital’s expert team of surgeons now perform this procedure robotically, with the assistance of the latest da Vinci robotic surgery system. This highly advanced, minimally invasive technology offers patients at Flushing Hospital a high success rate and a quicker recovery time. To schedule an appointment with a surgeon at Flushing Hospital who specializes in minimally invasive robotic surgery, please call 718-670 – 3135. Many people have gallstones without knowing it. Gallstones are hard deposits in your gallbladder, a small organ that stores a digestive fluid made in the liver. Bile usually dissolves or breaks down cholesterol. However, if your liver makes more cholesterol than your bile c an dissolve, hard stones may develop. Not all people experience symptoms from gallstones. According to the American College of Gastroenterology, 80 percent of people who have gallstones don’t have any pain at all. These are called “silent” gallstones. The most common symptom of gallstones is pain in the right upper quadrant of your abdomen. Many risk factors for gallstones are related to diet. To diagnose gallstones your doctor will perform a physical examination that includes checking your eyes and skin for visible changes in color. The examination may involve using diagnostic testing to see inside your body. These tests include Ultrasound, Abdominal CT Scan, Gallbladder Radionuclide Scan, and blood tests. If gallstones are detected in your gallbladder surgery is often the first option if you have significant symptoms. Technology in surgery is constantly evolving with the intent of increasing positive clinical outcomes and improving patient safety and recovery. One of the greatest medical advances to occur in the pursuit of these goals was the development of surgical robots. 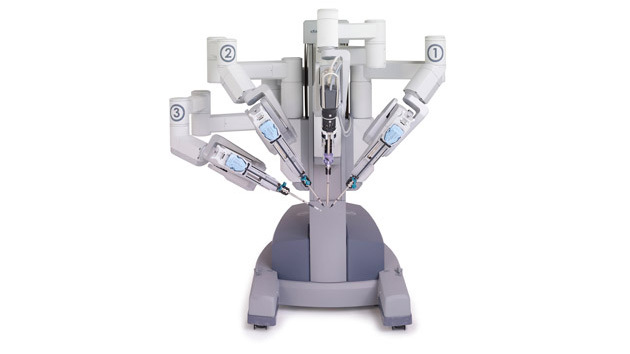 Flushing Hospital Medical Center in its dedication to supplying patients with superior and technologically advanced tools in health care, acquired the da Vinci Surgical Robot. This tool allows for a minimally invasive surgery with a faster recovery time. 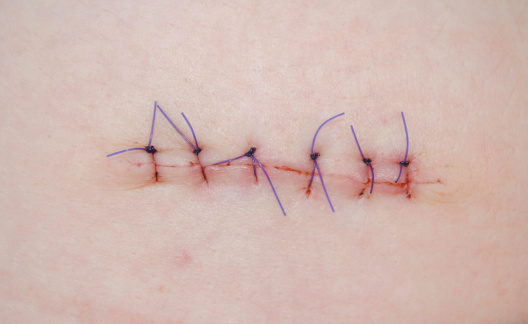 Sutures (also known as stitches) have been around for thousands of years and are used to hold wounds together until the healing process is complete. They were first described as far back 3000 BC in ancient Egyptian literature. For centuries they were made from plant materials like hemp, or cotton or animal material such as tendons, silk, and arteries. The material of choice for many centuries was catgut, a fine thread woven from sheep intestines. In the 1800’s it became apparent that it was a good idea to sterilize the catgut before using it to suture wounds, In the 1860’s the physician Joseph Lister devised a technique for sterilizing catgut and it was perfected finally in 1906. Eventually, sterilization took place by exposing the suture material to radiation which was more effective than previous techniques. Each development helped to reduce the risk of infection. Early in the 20th century synthetic materials were developed that could be used for suturing. These synthetic materials, still used today, were categorized as “absorbable” or ‘non-absorbable’ depending on their ability to be absorbed during the wound healing process. Additional new technology has added laser technology and surgical glue to the tools available to physicians for wound healing. These new materials help the process go quicker and also make the scars less visible. However, even with all the new modern techniques for suturing a wound, many of the basic concepts used today were first developed thousands of years ago. Instruments that come in contact with the body during all surgical procedures and many non-surgical procedures must be free of all microbial elements. This is to ensure that the risk of infection is kept to a minimum. Throughout history different methods were adopted using materials that were available at that time. In 3000 BC the Egyptians used pitch and tar as antiseptics. In later years the fumes from burning sulfur were found to cleanse objects of infectious material. In 1680 a French physicist, Denis Papin invented a pressure cooker that would trap boiling water, convert it into steam, and was found to cleanse objects by cooking them. This device was further improved upon during the next two hundred years and it became possible to additionally sterilize linens, dressings, gowns using steam. Two major contributions to the art of sterilization came in the 1860’s when the French chemist and microbiologist Louis Pasteur wrote extensively on how germs cause disease and the English physician, Joseph Lister, developed a technique that used carbolic acid as a spray to disinfect instruments. During the late 1800’s steam sterilization became much more widespread. Surgical instruments were also being made out of materials that were better able to withstand high levels of heat. This allowed them to be processed at higher temperatures and were being made with smooth surfaces which allowed for more thorough cleaning. During the 1900’s various improvements were introduced. This included sterilization with steam, irradiation, with glutaraldehyde. More recently, sterilization of instruments can be achieved using high temperature / high pressure, ultraviolet light, and the most commonly used chemical for sterilization is ethylene oxide. It can be used on almost all instruments, both metal and non-metal. The importance of cleanliness when it involves objects that come in contact with the body cannot be stressed enough. It was recognized in ancient times and improvements are still evolving today for the safety of patients. 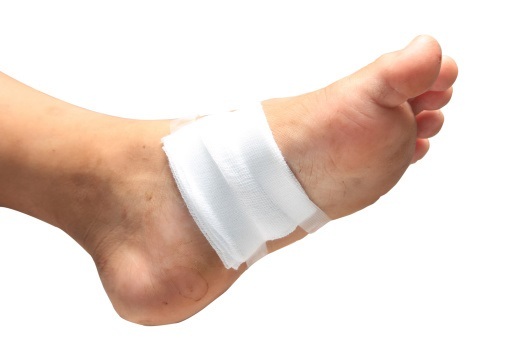 The nutritional status of a patient plays a large role in their body’s ability undergo wound healing. It requires a higher than normal level of energy and nutrients if it is going to be successful. The body requires an additional 35 calories per kilogram of body weight to help a chronic wound to heal. This will include eating a well-balanced diet that includes protein, grains, fruits, vegetables, and dairy. For proper wound healing, a well-balanced diet should include 1.5 grams of protein for every kilogram of body weight. A kilogram is equal to 2.2 pounds. Keeping hydrated is also very important, eight glasses of water per day should be the minimum and more if the person sweats profusely, has a wound that is draining, or if vomiting and or diarrhea are present. Meals should include meats, eggs, milk, cheese, nuts, seeds, yogurt and dried beans. In some people who have difficulty obtaining proper caloric intake from their daily meals, high protein and high calorie shakes can be used as supplements. Two amino acids, found in foods having protein and that have been identified as having potential to help wound healing are arginine and glutamine. People with diabetes often have difficulty with wound healing, and this is due to poor circulation, nerve damage which leads to the constant breakdown of healthy tissue components needed to heal, and a higher than normal level of sugar in the blood which can lead to higher rates of infection and causes fluids to be drained from the body. It is therefore very important for a person with diabetes to keep tight control of their disease. Wound healing also requires additional levels of vitamins and minerals, however care must be taken too not take in more that the daily recommended amounts because this can have a negative effect on the body.. It is important to consult with a physician about how to eat successfully when trying to heal a wound and also a nutritionist who specializes in wound care.